For its dedicated and persistent efforts to benefit horseplayers, which resulted in landmark regulatory changes modernizing federal rules allowing bettors to keep more of their winnings, the National Thoroughbred Racing Association (NTRA) will receive a Special Eclipse Award at the 47th annual Eclipse Awards on Thursday, January 25, in the Sports of Kings Theatre at Gulfstream Park in Hallandale Beach, Fla. The Eclipse Awards will air live on TVG at 8 p.m. ET/5 p.m. PT. For the past decade, the NTRA led a determined fight on behalf of the horse racing industry to address outdated federal income tax rules that depressed pari-mutuel handle, reduced purses for horsemen, and saddled horseplayers and tracks with onerous paperwork requirements. On September 28, 2017, these efforts culminated in the issuance by the U.S. Treasury Department of modernized regulations regarding the withholding and reporting of pari-mutuel winnings. As a consequence, horseplayers will retain more of their winning wagers while both horseplayers and tracks will be relieved of burdensome compliance procedures. The Special Eclipse Awards Steering Committee is comprised of representatives from Daily Racing Form, the National Turf Writers And Broadcasters, the Breeders’ Cup and the NTRA. 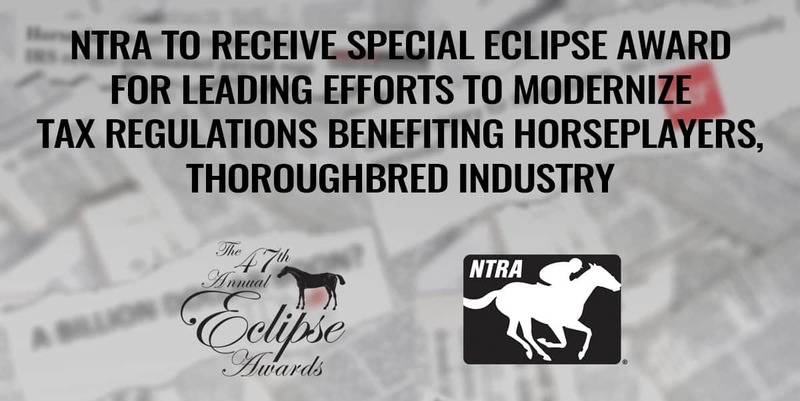 The NTRA recused itself from any discussions relating to the Special Eclipse Award once its name was put forward for consideration. The NTRA and Alpine, working with key Congressional allies, tax specialists from its longtime Washington, D.C.-based law firm, Davis & Harman, and others, had pushed for the modernization of pari-mutuel withholding and reporting rules since the early 2000s. As more and more pari-mutuel wagering was directed toward exotic wagering pools, it became clear that the tax rules were becoming an increasing and unfair burden on horseplayers and tracks as those outdated rules significantly increased the incidence of winning tickets subject to withholding and reporting. Under the new regulations, the IRS now considers the inclusion of a bettor’s entire investment in a single pari-mutuel pool when determining the amount reported or withheld for tax purposes, not simply the amount wagered on the winning combination. The effects of the new regulations had an immediate and dramatic impact at last November’s Breeders’ Cup World Championships at Del Mar. Despite some of the longest-priced winners in Breeders’ Cup history, only 35 winning tickets at the Del Mar Thoroughbred Club triggered IRS reporting or withholding via automatic W-2G filings across the two-day event. That represents a 97 percent reduction from the previous year, when 1,333 W-2G filings occurred on-track at the host site.